I spend many of my days lately laying my head down in Portsmouth, NH. It’s a not unfamiliar place, and very welcoming. This past weekend, with the Hunter in Alaska, I stayed up here with the dog and made my first pilgrimage to the city farmer’s market. It was breathtaking. It was a smile-a-minute. It was glorious. It was summertime. Unlike the time of year when strawberries and greens are picked frantically, greedily, desperately, this is the season of plenty. A walk around your local farmer’s market this week will leave you absolutely awe-struck. The farmers have brought forth so much goodness, from dirt so close to home. 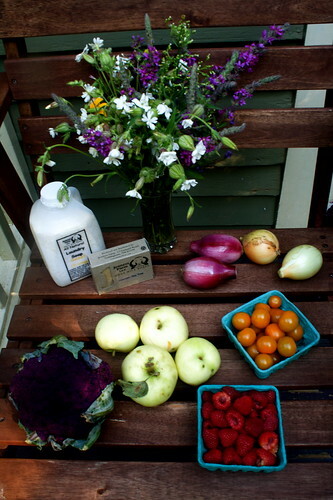 There are peaches and blueberries and cucumbers, tomatoes and chard and pac choi. You can buy lamb, beef, chicken, eggs, and fresh seafood! There is garlic, and basil, and purple heads of cauliflower that make you swoon openly in front of total strangers. Local cheesemakers tout their creamy goods alongside bakers and the raw milk sells out before 8:30. There are even apples! APPLES, in New England, in August! How is this even possible, you wonder? And so you ask. “Tell me the story behind these apples,” you say. And she does. The young, beautiful, smiling, friendly farmer tells you all about them — gushing — as if they were a long lost friend she has treasured since childhood. She tells you about their easily-bruised flesh, their initial tartness on the tongue (Granny Smith-like) that transforms into a sweetness that is beyond comparison to other apples. She even goes so far as to root through her stock and show you the difference between a ripening and ripe fruit, and you marvel that there are white apples in the world. 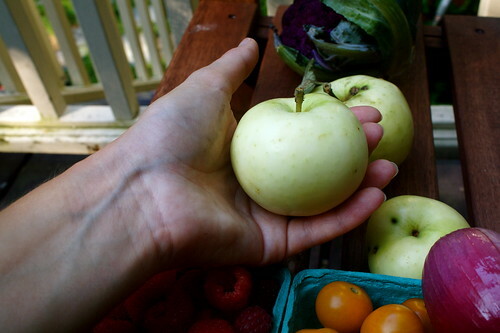 White heirloom apples that you never knew about. And you fill your arms, pay the woman, walk to the next booth, and smile at the glory of summer. Clockwise, from top left: natural laundry detergent (sweet orange) and goat milk soap (lavender and tea tree) from Jeness Farm in Nottingham, whose owner traded 4H stories with me. A beautiful, simple wildflower boquet. Red and sweet yellow onions that shine like no grocery store onion I’ve ever seen. SUNGOLD TOMATOES. Red, red raspberries. The aforementioned white summer apples. A purple cauliflower so gorgeous it could stop traffic. Just so you know: if interspecies marriage were ever to become legal, I just might marry a bush of Sungold tomatoes. I know it’s not always easy to get to your local farmer’s market. They’re often at inconvenient times or on inconvenient days, at inconvenient sites. But if at all possible, please make the effort to check yours out. Talk to the farmers. Swoon at the colors and anticipate the tastes. Fill your arms with the local bounty and marvel at what these people can create from the ground without pesticides, huge mechanized operations, GMO seeds, and oil money. Say thank you, and eat well. 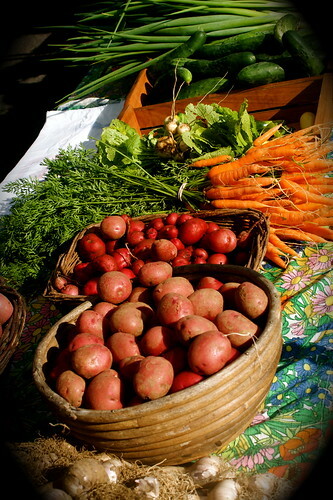 Here are some links for finding a farmer’s market or farm stand near you. Most will be open until October, so go now and go often. I wish I could go to the Portsmouth Farmer’s Market again this week. I am already daydreaming about the goodness that those men and women will unload from their vans, trucks, and hatchbacks in the early morning light. The music and flowers and open, friendly faces and chats about goat breeds and heirloom squash and natural pest control. But alas, I’ll be back on Cape Cod, seeing what the good folks in Orleans have to offer by way of their sandy, salty soil, and smiling and chatting with a new crop of dirt-loving food-makers, hoarding fruit and reveling in the late summer plenty. This is an article that was posted on Aug 18, 09:45 PM. Makes me yearn for the years the wife and I spent heading to that market. Luckily, we’ve been lucky finding great alternatives here on the North Shore and are eating more local than ever. Keep up the insightful posts! Yes really mouthwatering. Good selection. all are healthy items. your post is very inspirational. Being like a good house wife we have to take care of our family. Family health is the important. We have to spend time to choose healthy items. We love all these vegetables. thanks for sharing.